I want to reveal to you today how to properly read a team’s past results to predict future outcomes. Here’s the big mistake that many bettors make: They tend to think that what’s predictive for one team is just going to automatically apply another team. This is a trap! The truth is, a trend that applies to one team may actually apply the opposite way for another! For example, many of the patterns that form for The Warriors do not apply at all to the Cavaliers. I’ll tell you more about that in a bit. Now, I want to teach you how to read a team’s past results to predict future outcomes. Oftentimes you may not exactly realize how much work goes into it all because you’re only seeing the end results and not the process. 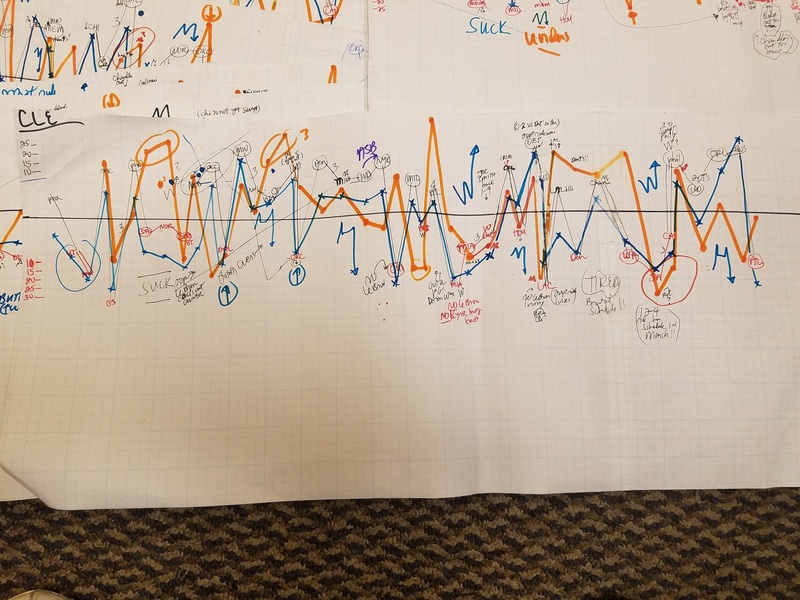 Today, I will share with you the pattern charts I use to analyze a team’s past results to predict their future performance. In the video at the top, you can see my actual pattern charts that I create and update every single day to help me predict the outcomes of future games. By hand, I create these charts for every single team in the league and update them at the end of each day with the latest results. These charts help me track the progress of every single team in the league, their past performance, and the most likely, logical direction where they’ll head to next. As a master pattern recognizer, it’s easy for me to glance at these charts and zero in on what could be the most likely future outcomes for each team. Here is the key: Each team is different. Many bettors make the mistake of thinking that what happens consistently for one team will also automatically apply to another. Here’s the truth: What’s predictive for one team may not be similarly predictive for another. For example, the pattern charts tell us that The Warriors tend to bounce back well after a loss, whereas the Cavaliers are the opposite. You have to treat each situation on a case-by-case basis because each team, players, and coaches have their own unique ways to react to each different situation. These charts help to paint a helpful picture to let you determine how each team react. I’m constantly looking for possible forming patterns for all the teams in the league. What I’m looking for are flow patterns, bounce patterns, up channels, down channels, trending signals, W bottoms and M tops patterns, the list goes on and on. Here’s an actual pattern chart for the Cleveland Cavaliers in the 2016-17 NBA season so you can see for yourself how one of these charts look like. This is the kind of chart that can help you predict future outcomes of a Cleveland Cavaliers game based on recent past results. I have a different chart made for every single team in the league. These charts are updated every day. As you can probably tell, there’s hours of work here involved to give you the winners day in and day out. And this is only the beginning. I’ve only scratched the surface as to what I go through every single day to pick out the winners for you. There’s much more to it, and one day I will teach you more so you can use the same strategies to help you pick out winners in any sport. Why do I spend so much time doing this? That’s because it’s not just your money that’s on the line. It’s also mines. Last month, I wagered a total of over a million dollars on the same picks sent out to my members. You can see proof of all betting tickets at The Whale Tracker. Know of any tout out there that wagered more than a million dollars on their own picks last month? I’m not aware of any. Not even close. So if they’re not betting along on their own picks by the millions, then how can you be sure that they’re actually spending the time to handicap these games as best as they can? How can you know if they even feel good about winning if they aren’t putting money where their mouth is? The difference with me is that I do put my money where my mouth is. Last month in January, I wagered over a million dollars on my picks, and walked away winning tens of thousands in profits. In fact, from December 30th until the first half of January, I went on a $150,000 winning streak which you saw clearly before your very eyes. Common sense will tell you that if I’m betting this kind of money on the games, then I’m not just simply throwing darts at the board and seeing what stick. There’s a lot of work and logic that goes into this, and hopefully today’s video can give you a bit of insight, appreciation, and wonder on what really goes behind the scenes to give out to you these picks and winners.